Aitor Karanka looks set to hand exciting signing Carlos de Pena his Middlesbrough debut tonight. The 23-year-old Uruguayan was an unused sub in the 2-1 win at Nottingham Forest on Saturday but could feature in the Capital One Cup tie againsat Wolves at the Riverside (kick-off 7.45pm). Carlos could play because he’s training really well but I have to be very sure because I don’t want to make a mistake with him. De Pena has impressed on the training ground at Rockliffe since his £2.6million transfer deadline day move from Nacional. Karanka, predictably, was keeping his cards close to his chest, insisting he needed to “find the right moment for him”. But the Spaniard is a head coach who has never been shy to make changes to a winning side. De Pena speaks English fluently and has settled in smoothly to the squad so tonight could be the night for the winger. “Carlos could play because he’s training really well but I have to be very sure because I don’t want to make a mistake with him. “He’s good. His English is really good and it’s easier for everyone when you can communicate with other players. “He had played a few games with Nacional and had a pre-season so he has games in his legs. If selected, the winger will come into a Boro side brimming with confidence after that success athe City Ground which cemented them in second place in the table. Boro are in brilliant form, but Karanka says all their thoughts are now on the cup and the third round toe with their Championship rivals. “For now, the league is forgotten, Wolves in the cup is our focus,” said Karanka. “My only objective at the moment is to win this game. 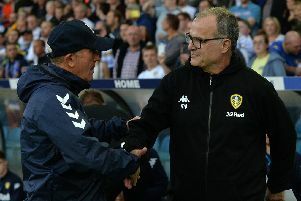 “Only when the Wolves match is finished will we think about Leeds on Saturday. “Wolves were a very good side last season. “They have lost players but they have good ones too. And while Karanka is happy to see his squad confident after five wins on the spin, he warned against complacency.